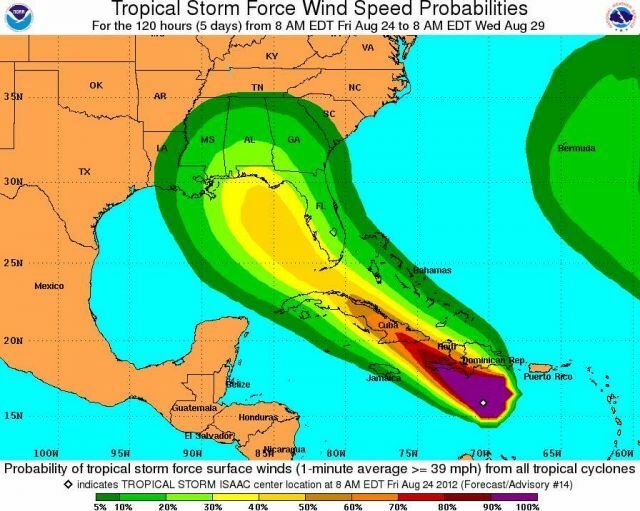 In which we answer your questions about Tropical Storm Isaac and the 2012 Republican National Convention. There’s a long list of scenarios that could sour the mood at the 2012 Republican National Convention in Tampa, Florida. “Newt University” could go off the rails. “Violent anarchists” may make an appearance. Fifteen thousand protesters and Occupiers could gum up the GOP’s works. The ban on puppetry might sadden Republican children. And then there’s the potential hurricane that could be barreling out west toward Tampa, just in time to spoil Mitt Romney’s big kickoff party. Here’s what you need to know about Tropical Storm Isaac, Mother Nature’s latest display of flagrant liberal bias. Where did the name “Isaac” come from? Isaac has been used for four distinct tropical cyclones in the Atlantic (tropical storms in 1988 and 2012, and hurricanes in 2000 and 2006). Names for hurricanes and storms are generally retired in the event of direct fatalities or extensive damage. What are the chances the storm touches down in Tampa? What has this thing meant for the GOP convention thus far? Organizers are closely watching developing news of the tropical storm, but have not yet announced plans to cancel, postpone, or move events. The Romney campaign is considering moving Ann Romney’s speech from Monday night to another evening, but that’s reportedly due to lack of TV coverage (major networks will air summer reruns during certain prime-time convention hours), not fear of a major hurricane. Are people besides convention-goers being affected by this storm? Yes, very much so, and given the widespread danger Isaac poses in the Caribbean, it seems sort of myopic to focus on the RNC: Puerto Rico has opened 428 shelters, and 50 people have hunkered down so far, according to Gov. Luis Fortuno. (Roughly 4,000 people are already without power, and more than 3,000 don’t have access to clean water.) The Virgin Islands are battening down the hatches as well and were hit with 40-mile-an-hour winds and a 10-foot surge of waves on Thursday. What role does Walmart play in Florida’s disaster response plan? Our ideal situation is one in which private sector, non-governmental organizations and local, state and federal government emergency management organizations…develop inter-operable plans that maximize those strengths and minimizes gaps in coverage…We feel that we are on the right road to get to this eventuality, but it will still be a long trip. It started with Hurricane Katrina, where the folly of planning in a vacuum and hoping for the best was exposed and the benefits of involving the private sector were clearly illustrated. Koon’s faith in Walmart’s ability to figure out a hurricane isn’t a total aberration; in 2008, multiple media outlets trumpeted “Wal-Mart to the Rescue,” an economist’s study (PDF) that concluded the big-box store performed impeccably in the post-Katrina recovery, thanks to “superior organizational routines that emerge through private ownership and competitive markets.” Few of these media reports pointed out that the author, Stephen Horwitz, is a politically conservative libertarian whose CV includes numerous articles for The Journal of Ayn Rand Studies. What have leaders in Florida been saying recently? “Public safety—that’s going to be the No. 1 priority. We can have the convention again,” Lt. Gov. Jennifer Carroll said on Wednesday. If this becomes a hurricane, where do folks find shelters? The Hillsborough County government has a list [PDF] of public hurricane shelters for both low and high intensity storms (all the listed locations are at local public schools). 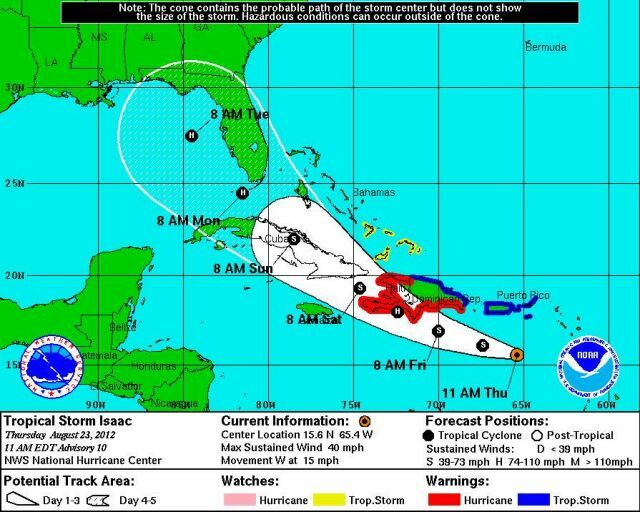 Is Tropical Storm Isaac a liberal conspiracy? I can see Obama sending FEMA in in advance of the hurricane hitting Tampa so that the Republican convention is nothing but a bunch of tents in Tampa, a bunch of RVs and stuff. Make it look like a disaster area before the hurricane even hits there. Is there something about GOP conventions that attract hurricanes? Not quite, but this isn’t the first time something like this has happened, either. For instance, just back in 2008, Hurricane Gustav hit Louisiana while Republicans were beginning their national convention in St. Paul, Minnesota. Even though the hurricane ended up missing St. Paul by hundreds of miles, weather concerns caused organizers to cancel or roll back several opening-day events. And, of course, there are still the ghosts of Hurricane Katrina. So, is climate change making this worse? Well, it can’t be helping. Earlier this summer, MoJo‘s Julia Whitty wrote about the reasons (“hotspots” in sea surface temperatures) that 2012 might be a bigger hurricane year for the East Coast. Much of southern Florida could receive 6-9” in the next few days, with locally higher amounts. Areas in Haiti and Dominican Republic could see 10-20” of rain, with 6-12” in Jamaica and eastern Cuba. Besides flooding, additional threats include coastal storm surge, tornadoes, and of course, winds from the storm itself. My name is Pete McGrain. I wrote and directed ETHOS, a powerful new political documentary that stars WOODY HARRELSON as host. The film looks at the systemic issues; conflicts of interest in politics, rampant over–consumption, unregulated corporate power, and a media in the hands of massive conglomerate interests, that guarantee our failure in every aspect of our lives, from the environment to democracy, to warfare and our own personal liberty. The film however, offers a solution. A simple but powerful way for us to have our voices heard as they have never been heard before.With interviews from some of today’s leading thinkers and source material from the finest documentary film makers of our times Ethos examines and unravels these complex relationships, and offers a solution, a simple but powerful way for you to change this system! In keeping with the principals of the film we are not using corporate media to distribute the film. We are also offering the film for free download so everyone can get this information, not just those who can afford it.